I spent Labour weekend with my 6 year old son and my parents beach house at Pukehina. Using a kite longline we baited up 19 hooks with squid, a moderate south east made getting a fishable tack quite difficult, but we managed to get it right after several attempts. A south easterly blows almost parallel to the beach. We landed 7 good sized snapper, the largest was about 4 lbs. I also caught a small stingray which still had plenty of life left so we released it. We had great fun with grandma manning the reel, me hauling the line, granddad as official lookout for fish, and my son keeping us all on our toes! Question: Are stingrays any good to eat, or do they make good bait? Answer: The wings of the stingray are good eating and are OK for bait. Cut the wings off clear of the body cavity to avoid a huge mess. Fillet the wings to remove the flat cartilage in the center, then skin before cooking any way you like. The taste is similar to lemon fish as the diets of both species mainly consists of crabs and shellfish. I have used them for bait when commercial fishing but, while we caught some fish, I don't recall being overly impressed with the results. I would prefer to use more conventional baits. Here are two photos of Kevin Griffiths and Emma with her winning fish during the kite club's latest club weekend away up north. The photos were taken at Uretiti Beach. Emma's snapper weighed in at 2.1kg. Second prize went to Peter Berry for his 2.0kg snapper. 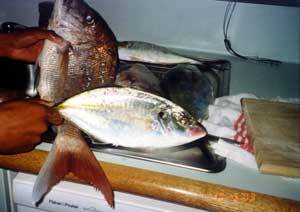 The total catch for the club on the weekend was 34 snapper, 5 gurnard, 1 kahawai, 1 skate and also 4 blue maomao. Right : We caught these fish off Army Bay, Wellington Rock at our favorite fishing spot late August. Dad landed a nice 12 lb snapper. I caught the squid on a lure early in the morning. We were using both Target Snapper Hooks and other brands and many of the fish were taken on the Target Hooks. We caught 15 snapper, 2 kahawai, 3 trevally and 3 squid all together. Left: Caught this good catch while fishing from the boat with Dad off Wellington rock at Army Bay on October 5th. Again some of the fish were taken on Target Hooks. I also caught a 4.5 kg kahawai off Muriwai Beach during winter this year using our 100kg kite bottom longline rig baited with sprats. Next time go I will send some pictures of the fish caught on our kite rig. Well I made the October local monthly paper, not for a fish but a rather humorous kite set. 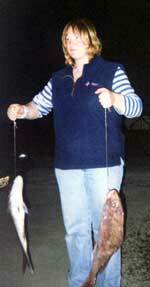 It all started when I decided to go whitebait scooping at the Mokau river mouth while the Mega Air 3 Inflatable kite had my line way out fishing. If it wasn't for the fact I was catching a lot of whitebait I would normally have gone and attended my kite reel as I watched the wind changing, dragging my line closer in. Then, within a couple of minutes some huge gusts of wind came and up the kite went, the bottle came out of the water and climbed up over the batches and streets 1000 metres above Mokau. Like Paul says, at about 30 knot winds the inflatable kites collapse, and down she came with the hook section, weights and a single gurnard draped over about 10 batches and line everywhere on the road. With the help from friends and locals I recovered everything minus the fish. 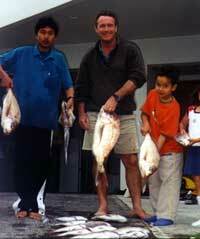 On the fishing front October has only provided gurnard and kahawai for us kite fishermen. We had one flat calm weekend and a lot of boats were able to get out fishing. Well known local, Ray Christiansen, got a lovely snapper weighing in at 13.14kgs. Also a couple more 8 and 9kg fish were caught by others. I've decided to make the trip north for the kite fishing competition entering the teams event with Steve McEwan from Stratford. We're looking forward to spending a few days with other kite fishermen at this event. On the 31st of October in a moderate southwesterly I managed to tack the kite enough to get it flying straight out but even though the surf was only slight, the strong rip dragged the main line off to the right about at 45 degrees. I was using a bottom longline rig with 25 hooks, baited up with octopus and we still managed to catch one good sized snapper. Maybe I should have used a skyhook or invest in a 65kg dropper rig or would the new Mega Air 3 have enough grunt to pull the line straight out or near enough to straight? Editors note: The Mega Air 3 has more than four times the pull of any delta fishing kite. In winds over 5 to 7 knots I believe no rip would prevent you from fishing with a Mega Air 3. They are an extremely efficient kite in light winds and will fly in as little as 2 knots of wind. I wouldn't recommend them in strong winds as I have had one pulling 20 kilograms in 15 to 20 knots of wind. Labor day dawned fine and calm but more importantly the sea was flat. We set an electric kontiki out three times with good success for this time of the year. The biggest catch and biggest surprise was a 12 foot thresher shark. We also landed 5 snapper, 4 gurnard and 10 kahawai. There were kahawai working all day, which is a very rare event these days, and hopefully a good sign for summer. While we did catch a few snapper the numbers should improve as things warm up. Monaroa Beach is a great beach for longlining as it has a sandy bottom with no snags. I have been using the electric kontiki for 2 years on the both west and east coasts and mine works brilliant even in big surf and current. I will try and keep a regular report coming as things hot up. Editors note: I think you were very lucky to land such a big shark without snapping the mainline. We are aware of several electric kontikis being lost on the west coast, the most likely cause is through sharks biting through the mainline. A couple of torpedoes got washed back in and were broken in the surf and a third was found at sea eight miles out from the Kaipara Harbour. The same thing happens with kite longlines used on the west coast. There is only one safe way of fishing multiple hooks on the west coast and that is to use a dropper rig. The strongest part of the dropper rig is the mainline between the reel and the kite. The terminal tackle, which drops down from the mainline, is progressively sacrificial with the weakest part being the safety trace in front of the hook section. If you snag the hook section, or hook into sharks too big to land, you only lose the hook section, you cannot lose your kite through sharks. I went fishing off Red Beach on Friday the 24th after school and baited up with kahawai. 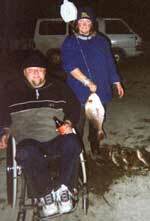 On my first set I caught two good sized snapper about 40cm and the second set nothing. On Monday there was no school so I was going to go kitefishing but the wind changed so me and six of my friends went out surfcasting off the rock at Duncanby at Red Beach. We went out at 6:00am and it was nice and calm. I got a fish on my first cast using pilchards for bait. It was very good fishing and everybody caught a fish or two. Most of the fish landed were kahawai then about 10:00am the wind picked up and the sea started getting rough. After that there were no more bites but there were still a lot of sprats and piper still around. We tried to catch them for bait for our boat trip next week, if the weathers any good. We fished till around 4:00 in the afternoon and wound up with 13 kahawai, 20 sprats and 8 piper which I kept for bait next time. I hope to be getting a digital camera soon so I can send you some photos. Allan phoned a few days ago to report that while fishing a boat longline in the Hauraki Gulf just two weekends ago, around the 30 metre mark off Colville, he ran two sets for 8 snapper and one massive john dory. According to Allan, when he was cleaning and filleting the dory, he found a completely intact 25cm snapper in the gut of the fish. The fillets on this huge dory were 40mm thick. Allan was using salted pilchards on his longline which he cut in half and put half on each hook. He has also had reports of boat fishermen fishing the Kawhia area, around 50 metres deep, and catching plenty of 20 to 25lb snapper. Allan runs Waikato Sheet Plastics in Frankton and has set aside part of his shop to include a fantastic display of kitefishing products which is a must see. Allan carries a wide range of fishing kites, kite rigs, boat longlines and accessories. If you're in the area, stop in and say hello, check out his range of products or just simply talk fishing.